One of the exciting things about being a hairstylist are the skills you acquire to style hair for special occasions. Weddings are one of those special occasions where hairstylists shine, and many brides want the best hairstylists around for their special day. In fact, the wedding industry has become so huge that many salons and hairstylists have built their careers around bridal hair only! But, how do you build up a bridal business of your own? We recently answered that question on the Beyond The Technique podcast with the help of our guest, Renee Feldman. Renee knows the importance of creating a bridal hair business on both sides of beauty and finances. She is one the most sought-after hairstylists in Chicago and has been featured in multiple magazines such as Bride’s Chicago Style, and has worked with celebrities like Sharon Stone and Gloria Steinem during the span of her 20-year career. Through her intuitiveness and determination, Renee has turned her creativity into her career, and she was kind enough to share with our followers tips to finding success in the bridal hair industry. Before she had her own bridal business, Renee credits the connections she built as an important step in building her clientele. She said going to a local salon after beauty school in the gold coast of Chicago helped her see what kind of work she wanted to be doing. Renee said that connection led her to being invited to the hotel when celebrities were in town and soon she was doing their hair for them in their hotel rooms! She continued to get booked for future events and soon had an extensive clientele list before going out on her own. Renee encourages hairstylists who want to go into the bridal industry to make connections with the bridal or event coordinator. Brides will hire event coordinators to help them through the stress of planning a wedding. They often look to their coordinator for recommendations and opinions, so if you have the “in” with a few wedding coordinators, you will have an easier time booking bridal hair appointments! The lesson here is to take time to use the networks you have! Working your connections will lead to an even bigger network of clients and will help you take your bridal business to new heights. Working with a bride is a different experience than working with other clients. 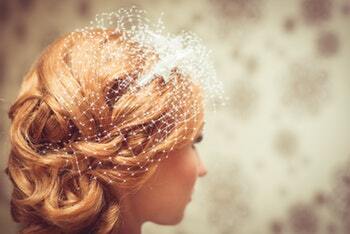 As a bridal hairstylist, it’s your mission to ensure the bride both feels and looks her best. Renee stresses the importance of having a comfortable work experience between the stylist and the bride. Renee also recommends that her brides go through a 90-minute trial period for the look they want for their big day to ensure Renee achieves the right hairstyle. Renee suggests starting with a small style for the bride during each session so they can work their way up to the final style they desire. Building a strong relationship with your bride is just as important as building connections with others in the industry, such as the event coordinator. If you do a great job with one bride, she will tell her friends, which will result in more referrals and bookings for your business in the future! Once you’ve made a solid network of connections and you’ve created a process with your brides, finding new ways to grow after you have found success is a great way to continue being excited about your business. Experiment with different ways to promote your bridal business, whether that’s taking out an ad in a bridal magazine or attending a bridal show – it’s a good idea to invest some of your success into expanding your business. Another option for growth to consider is hiring new talent. Many times a bride will want her stylist to help with the other members of the bridal party, which can be a tall order for one person! If your bridal business is taking off, consider hiring additional team members! While Renee is most passionate about bridal hairstyling, she encourages stylists who are new to the industry to learn as many niches as they can in the beginning. To listen to the full interview with Renee Feldman click here. If you are in the Chicago area, be sure to check out Renee Feldman salon.